I am still working through those mixed media middle grade novels. This book is the fourth in a series. I hadn’t heard about it before getting it from the publisher at BEA. In fact, I hadn’t been asked about it until after I finished reading it. One kid at the library is obsessed with this series and was desperate to get the newest book in the series. 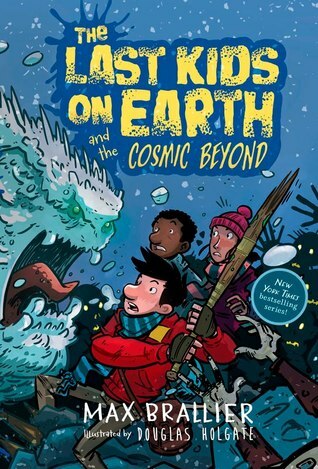 Unfortunately, I gave my ARC away to another kid…so based on all of this, I am thinking this is a more popular series than I realized. Here is my honest review. Monsters have taken over the world and Jack and his friends are working to stay alive. Currently, the world is covered in snow and ice, which totally freaks out the friendly monsters. Jack and friends are trying to help their monster friends get better with snow, so that they can be better prepared to fight the villainous monsters. Recently, the group has been attacked by a new villain in town. Jack has lost his favorite weapon and will stop at nothing to get it back and stop the new threat. I feel that I would have had a better appreciation of this novel had I read the first few books. I like the zombie loving reader will enjoy these action heroes.